International Journal of Research in Health Sciences,2017,5,1,14-17. Government General and Chest Hospital, Osmania Medical College, Hyderabad, Telangana, INDIA. Chondrosarcoma is the most common primary malignancy of the chest wall but occasionally primarily arise within the lungs and bronchi. 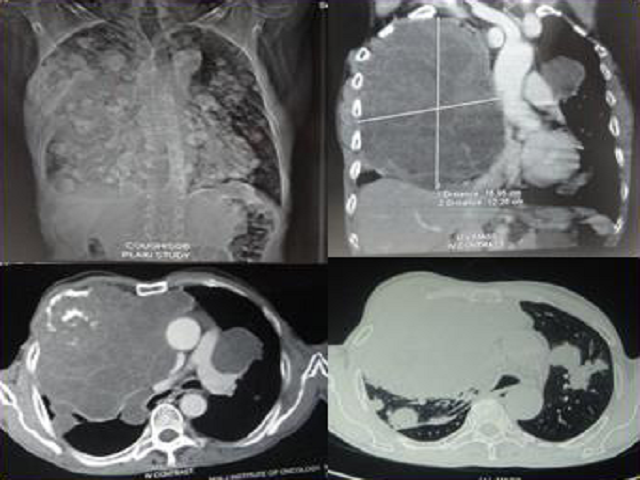 Sometimes tumors arising from the ribs and sternum manifest as large intrathoracic masses with only minimal osseous involvement. In this case report a 60 year old male, presented with swelling in the right mammary area. Radiologically there is an irregular expansile lobulated soft tissue mass lesion arising from the right third anterior rib. Histopathology was suggestive of chondrosarcoma.